BEIJING -- (Marketwire) -- 11/05/08 -- At the OpenOffice.org (OO) Conference, IBM (NYSE: IBM) today announced a long-term commitment to the OpenDocument Format (ODF) by unveiling a roadmap for the expansion of the free Lotus Symphony office application suite to MacIntosh, Ubuntu Linux, OpenOffice 3.0 and Microsoft Office customers. In his keynote speech, Michael Karasick, Director of IBM Lotus China Development Labs, outlined the evolution of Symphony, which first appeared as a public beta on September 18, 2007. The newest version is now available in beta for the first time for the Apple MacIntosh operating system (Mac OS X), and Symphony for Canonical's Ubuntu 8.0.4 Linux is also available. These new platforms reflect growing demand for Symphony, which has already been downloaded more than three million times worldwide in 28 languages. Karasick also pointed forward to the Symphony roadmap for 2009, when future generations of Symphony will be developed entirely on the ODF 1.2 and OpenOffice 3.0 software code base, bringing it in line with the newest OO technology. This advance will also enable seamless interoperability with Microsoft Office 2007 file formats and support Visual Basic macros next year. IBM plans to deliver more than 60 new features to Symphony in 2009, building it into a versatile tool for work while pledging to keep it free on the Web for all. By synchronizing Symphony's user interface with the underlying OpenOffice 3.0 code base, IBM expects the upcoming wave of planned contributions to make a significant impact to the OpenOffice developer community and its users throughout 2009 and beyond. Mac OS X support is among the top requests made by the members of the Symphony community. The IBM Symphony development team worked to ensure that Symphony not only works on Mac OS X but is tuned to take advantage of the Aqua GUI theme, with the originality and simplicity Mac customers have enjoyed. Initially available in English, Symphony for Mac OS X will get global language support as it progresses out of beta to general availability. Another top request, support for Symphony on Ubuntu 8.0.4 Linux, has quickly moved to general availability. Symphony 1.1 provides a debian package optimized for Ubuntu 8.04 (Hardy Heron). Ubuntu is a community developed operating system for laptops, desktops and servers noted for its ease of use, array of application support and focus on being ready-to-use. "Support for Mac and Ubuntu are good examples of IBM's long-term commitment to critical standards like the Open Document format," said Karasick. "As we rebase Symphony on OpenOffice 3.0, we are very excited about providing next- generation document creation and collaboration capabilities for the millions of potential users out there. IBM also sees the potential for the global developer community to use Symphony extensibility in concert with that of ODF 1.2, so that documents can be more deeply integrated into business applications and processes." 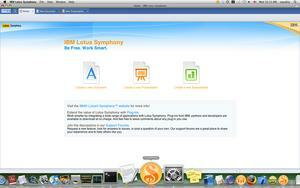 IBM Lotus Symphony is based on OpenOffice code, with IBM enhancements that allow new capabilities through Eclipse plug-ins and incorporate some of the OpenOffice 3.0 code. Plug-ins extend the power of the individual to accomplish more varied tasks with Symphony than they could otherwise accomplish with alternatives like Microsoft Office. For example, Internet searches launched from within a document could save time while drawing precise data into the right context, increasing accuracy and impact. A Symphony plug-in for IBM's Yahoo Omnifind Personal Edition search tool can help accomplish just that. Another example is the Symphony accessibility plug-in, which enables the visually impaired to easily work with word processing, slide or spreadsheet files. The accessibility plug- in uses an audio screen reader to inform the individual of the content and status as changes are made. For a full list of currently available Symphony plug-ins at no charge, visit (http://symphony.lotus.com/software/lotus/symphony/plugin.nsf/home). The underlying use of Eclipse through Lotus Expeditor allows developers to use open tools to customize the Symphony user interface so individuals can change their view of, and access to, desktop utilities such as file menus and toolbars for greater personal efficiency. Symphony 1.2 also contains data pilot tables, also known as pivot tables, which lets people quickly and easily sort large spreadsheets in more meaningful ways, making the spreadsheet data far more applicable and accessible to business activities. Alok Industries, a publicly traded textile and apparel fabric manufacturer in Mumbai, India. The Anglican Church of Australia, based in Sydney, which is openly phasing out Office in favor of Symphony for an estimated US$150,000 in annual savings. Client organizations that benefit from Church community services will also use Symphony, including schools, youth groups and aged care facilities. Calvary Baptist Academy, a private school located in Shreveport, LA, which is using Symphony as part of a small-medium business solution led by Lotus Foundations and delivered by IBM business partner, Altis Computer Systems. DotRiver, a French computer services firm focusing on virtualization and storage technology. The Hester Group, a Jacksonville, Florida-based branding and marketing group specializing in public awareness service announcements for diverse demographics. Symphony is part of a small-medium business solution with the Lotus Foundations software appliance, delivered by IBM business partner OnSite Technology, Inc.
Grupo Schahin, one of Brazil's largest, multi-industry conglomerates in banking, energy, aerospace, telecommunications and other sectors. Pearson, an international media company with world-leading businesses in education, business information and consumer publishing based in the United Kingdom and New York. Premier Auto Electric Ltd (PAE), a nationwide distributor of automotive parts in India. Sinochem Corporation, a Beijing, China-based, state-owned petrochemical company helping to align the transformation of agriculture, energy and chemicals with the development of China's economy. Smartline, an award-winning financial services firm in New South Wales, Australia. Suntel, a national telecommunications leader in Sri Lanka, which installed Symphony in place of Office. Winsol, a Belgium-based manufacturer of PVC and aluminum doors and other housing products. "After one day of using Lotus Symphony, some of my users asked if they could uninstall their Microsoft Office software," said Katia Sanfins, CIO of Schahin Engineering, Grupo Schahin. At least 80 percent of traditional and non-traditional office workers are considered "task users," who create and edit documents, spreadsheets and presentations. People in customer service and most roles in other corporate support functions fit this use pattern. These categories constitute the majority of Symphony users. Another category that is migrating to Symphony consists of "medium power users" -- those with more robust needs for documents, spreadsheets and presentations. These users -- such as sales departments working with clients -- requires stronger interoperability to enable collaboration with Microsoft Office users. "Lotus Symphony is an exciting offering which can save our business real dollars, up to $600 per seat. Standardising our platform Office productivity suite will allow us to streamline development by maintaining a single codebase and reduce IT support issues," said Ganesh Radhakrishnan, IT Manager, Smartline Mortgage Services. "I have been using it to load in a huge complex spreadsheet and everything works perfectly." "Our initial evaluation and pilot of Lotus Symphony has gone very well. We see a lot of potential in leveraging Lotus Symphony, especially in support of our Mac OS X users, and look forward to participating in this beta," said Michael Colucci, VP of Architecture, Engineering and Support, Pearson. "I have used the Symphony software and have found it to be as good as or better than Microsoft Word," said Kathy Rutledge, Calvary Baptist Academy. "After using MS Word for eighteen years, I was hesitant to even try another word processing program. But after giving Symphony a chance, I found it very user-friendly. I would recommend Symphony to anyone looking for a user-friendly software that includes word processing, slide presentation, and spreadsheet capabilities."